“Would you take my photo here?” an Irish voice asked as I stood looking into the black abyss in the footprint of the South Tower, quietly paying my respects to those who’d perished. I gladly snapped the redheaded man’s image with the serene waterfall behind him. The simple black fountain impressive, the expanse across the footprint of the towers powerful. 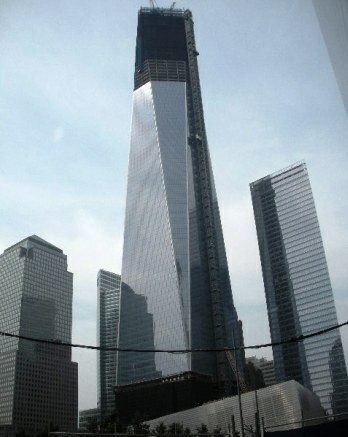 The new buildings climbed above, offering a new life to the World Trade Center plaza. He took a look at the photo and handed me back his camera. “Would you please include the name of Brian in the picture?” he asked, placing his hand near the engraved name on the brass plaque. My heart sank. “I’m sorry. Is he someone you knew?” I tentatively asked. We spoke of all the Irish immigrants who became policeman and fireman. I mentioned my grandparents and my mother’s father who helped build New York City’s subways. Soon we were discussing politics and the situation in Northern Ireland where he hailed from. “If you can resolve your conflict, there’s hope for anyone,” I suggested. He spoke of the finer points to the clashing Catholics and Protestants, the history and the current situation. As the waters flowed next to us, I thought what better discussion to have on this hallowed ground. “You got this right,” said Brian, gesturing to the 9/11 Memorial site. I was moved. Choked up, we both paused looking over the solemn and beautiful memorial and the visitors touching the names in reverence. Brian left to return to a nearby hotel, where he’d left his wife and children, who hadn’t care to come with him. I recalled all the times I visited the World Trade Towers–trips to the observation deck with my brother and his kids during a wild storm, on the rooftop with a Port Authority engineer, dinner at the Windows on the World, a reception for MTV’s gold record for Adam Ant. The bicentennial, the Tall Ships, and the quiet floating feeling at the top of more than 100 floors, where the Twin Towers managed to dwarf Manhattan. 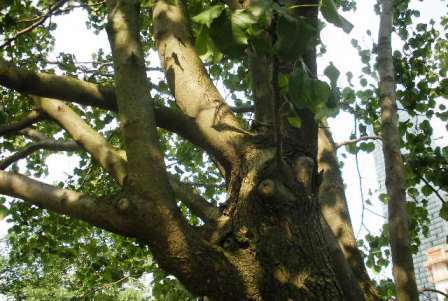 The Survivor Tree shows new branches. Overwhelmed, I touched The Survivor Tree, marveling at its new growth, limbs full of bright green leaves. I agree with Brian–they got it right. 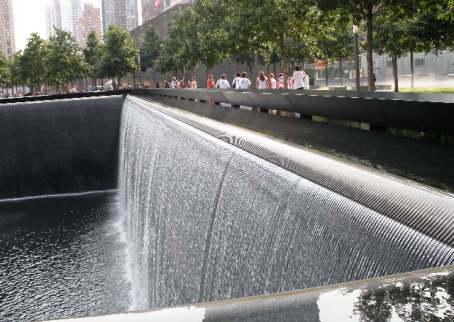 When the surrounding construction ends and the new shiny towers and museum opens, these two black holes filling with cascading water will remain as a fitting reminder. 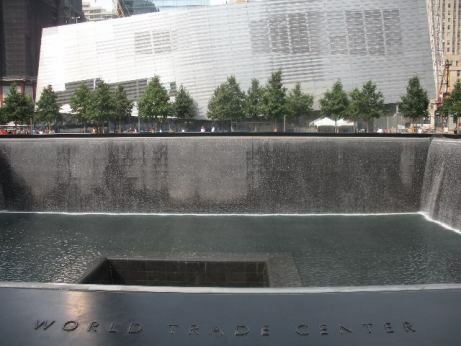 This entry was posted in Art and Design, Travel and tagged 9/11 memorial, Irish, New York City, world trade center. Bookmark the permalink.